This Lodge has 4 bedrooms and sleeps 9 people. It is close to the mouth, on the south side of one of the South Island’s best salmon rivers. This is also a great trout fishery and sea run trout in the 10lb range are often caught. There is a full electric stove and refrigerator/freezer and microwave. The single garage enables the storage of dinghies and 4 wheel farm bikes. This garage also has a shower and toilet. Nearest telephone in case of emergency: see the sheet in the blue folder in the hut. Cell phone coverage is patchy and should not be relied on, particularly down on the beach. Nearest shops/garage: Rakaia – about 20 minutes drive away (20km). Hut address: Our Don Brown Memorial Hut is situated at hut # 25, South Rakaia Huts. Some 68 km (55 minutes) drive from Hornby. 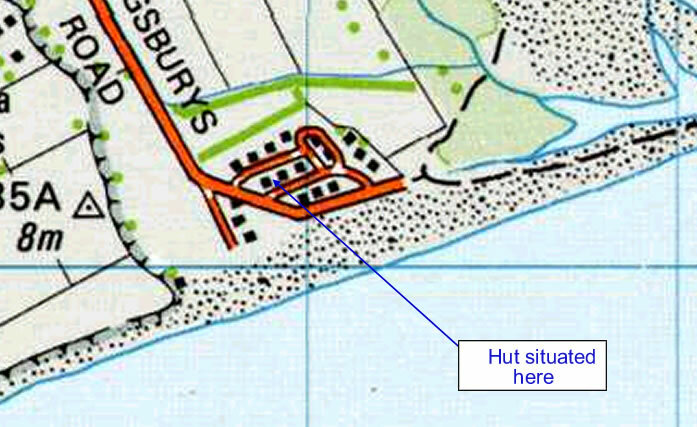 First turn left into Dolphin Drive, after turning into the Hut Reserve. Rakaia River Mouth: This area can be particularly dangerous for the unwary and the foolhardy. Life jackets are advisable when fishing. (Inflatable life jackets cost less than $100). The river changes course dramatically and often suddenly during freshes. When the shingle spit is narrow, high tides can break over the top of it sweeping away carelessly parked vehicles and / or anglers who show poor judgement. Treat the area with caution and use your common sense. Make sure kids are well supervised. Avoid taking a heavy 4WD along the top of the shingle spit. It is only really suitable for a 3 or 4 wheel bike, and YOU WOULD MORE THAN LIKELY GET STUCK IN A HEAVY 4WD. It is possible to get to the mouth in a light/ medium 4WD by picking your way around the hardpan area, immediately next to the edge of the lagoon, BUT that depends on just how far away the mouth is. If in doubt ask around of the other people in the hut area for access advice. There is many a tale of stuck vehicles from our own club members in the visitor’s book at the Don Brown Hut and of a days fishing wasted, because they had to recover their vehicle. Take care, and don’t become another story! * by 3 or 4 wheeler bike.